The reconciliation agreement signed between rival Palestinian parties, Hamas and Fatah, in Cairo on October 12 was not a national unity accord – at least, not yet. For the latter to be achieved, the agreement would have to make the interests of the Palestinian people a priority, above factional agendas. The leadership crisis in Palestine is not new. It precedes Fatah and Hamas by decades. Since the destruction of Palestine and the creation of Israel in 1948 – and even further back – Palestinians found themselves beholden to international and regional power play, beyond their ability to control or even influence. The greatest achievement of Yasser Arafat, the late and iconic leader of the Palestine Liberation Organization (PLO) was his ability to foster an independent Palestinian political identity and a national movement that, although receiving Arab support, was not entirely appropriated by any particular Arab country. The Oslo Accords, however, was the demise of that movement. Historians may quarrel on whether Arafat, the PLO and its largest political party, Fatah, had any other option but to engage in the so-called ‘peace process’. However, in retrospect, we can surely argue that Oslo was the abrupt cancelation of every Palestinian political achievement, at least since the war of 1967. Despite the resounding defeat of Arab countries by Israel and its powerful western allies in that war, hope for a new beginning was born. Israel reclaimed East Jerusalem, the West Bank and Gaza, but, unwittingly unified Palestinians as one nation, although one that is oppressed and occupied. Moreover, the deep wounds suffered by Arab countries as a result of the disastrous war, gave Arafat and Fatah the opportunity to utilize the new margins that opened up as a result of the Arab retreat. The PLO, which was originally managed by the late Egyptian President, Jamal Abdul Nasser, became an exclusively Palestinian platform. Fatah, which was established a few years prior to the war, was the party in charge. When Israel occupied Lebanon in 1982, its aim was the annihilation of the Palestinian national movement, especially since Arafat was opening up new channels of dialogue, not only with Arab and Muslim countries, but internationally as well. The United Nations, among other global institutions, began recognizing Palestinians, not as hapless refugees needing handouts, but as a serious national movement deserving to be heard and respected. At the time, Israel was obsessed with preventing Arafat from rebranding the PLO into a budding government. In the short term, Israel achieved its main objective: Arafat was driven to Tunisia with his party’s leadership, and the rest of the PLO’s fighters were scattered across the Middle East, once more falling hostage to Arab whims and priorities. Between 1982 and the signing of Oslo in 1993, Arafat fought for relevance. The PLO’s exile became particularly evident as Palestinians launched their First Intifada (the uprising of 1987). A whole new generation of Palestinian leaders began to emerge; a different identity that was incepted in Israeli prisons and nurtured in the streets of Gaza and Nablus was sculpted. The greater the sacrifices and the higher the Palestinian death toll rose, the more heightened that sense of collective identity grew. The PLO’s attempt to hijack the Intifada was one of the main reasons why the uprising eventually faltered. The Madrid talks in 1991 was the first time that true representatives of the Palestinian people in the Occupied Territories would take on an international platform to speak on behalf of Palestinians at home. While Arafat and his Tunisian faction were allowed back to rule over occupied Palestinians with a limited mandate provided by the Israeli government and military, Palestinian society fell into one of its most painful dilemmas in many years. With the PLO, which represented all Palestinians, cast aside to make room for the PA – which merely represented the interests of a branch within Fatah in a limited autonomous region – Palestinians became divided into groups. The crackdowns reached many Palestinians who took leadership positions during the First Intifada. The Israeli gambit worked to perfection: The Palestinian leadership in exile was brought back to crackdown on the leadership of the Intifada, while Israel stood aside and watched the sad spectacle. Hamas, which itself was an early outcome of the First Intifada, found itself in direct confrontation with Arafat and his authority. For years, Hamas positioned itself as a leader of the opposition that rejected normalization with the Israeli occupation. That won Hamas massive popularity among Palestinians, especially as it became clear that Oslo was a ruse and that the ‘peace process’ was moving towards a dead-end. When Arafat died, after spending years under Israeli army siege in Ramallah, Abbas took over. 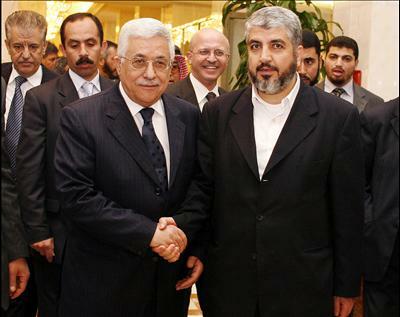 Considering that Abbas was the brain behind Oslo, and the man’s lack of charisma and leadership skills, Hamas took the first step in a political maneuver that proved costly: it ran for the PA’s legislative elections in 2006. Worse, it won. By emerging as the top political party in an election that was itself an outcome of a political process that Hamas had vehemently rejected for years, Hamas became a victim of its own success. Expectedly, Israel moved to punish Palestinians. As a result of US urgings and pressures, Europe followed suit. The Hamas government was boycotted, Gaza came under constant Israeli bombardment and Palestinian coffers began drying up. A Hamas-Fatah brief civil-war ensued in the summer of 2007, resulting in hundreds of deaths and the political and administrative split of Gaza from the West Bank. Officially, Palestinians had two governments, but no state. It was a mockery, that a promising national liberation project abandoned liberation and focused mostly on settling factional scores, while millions of Palestinians suffered siege and military occupation, and millions more suffered the anguish and humiliation of ‘shattat’ – the exile of the refugees abroad. Many attempts were made, and failed to reconcile between the two groups in the last 10 years. They failed mostly because, once more, the Palestinian leaderships leased their decision-making to regional and international powers. The golden age of the PLO was replaced with the dark ages of factional divisions. However, the recent reconciliation agreement in Cairo is not an outcome of a new commitment to a Palestinian national project. Both Hamas and Fatah are out of options. Their regional politicking was a failure, and their political program ceased to impress Palestinians who are feeling orphaned and abandoned. For the Hamas-Fatah unity to become a true national unity, priorities would have to change entirely, where the interest of the Palestinian people – all of them, everywhere – would, once more, become paramount, above the interests of a faction or two, seeking limited legitimacy, fake sovereignty and American handouts. The split in Palestine forces will assist zionist Israeli government to obtain a firm grip over the land occupied by it. Therefore, these groups should keep personal prejudice aside and work for liberation with unified determination. The groups must realise that unity is ‘ strength ‘ . !